Lillian L. “Lilly” Shields, 82, of Lewis Run, passed away on Sunday, December 2, 2018 at UPMC Hamot, Erie, surrounded by her loving family. She was born on March 28, 1936 in Bradford, the daughter of the late Ernest and Rena Vecellio Bombasay. 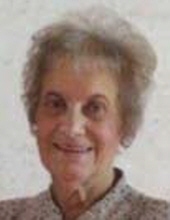 She was a 1954 graduate of the Bradford Area High School. On July 6, 1957 in Our Mother of Perpetual Help Catholic Church, Lewis Run, she married Donald J. Shields; who preceded her in death on May 30, 2011. She was a member of Our Mother of Perpetual Help Catholic Church. She enjoyed spending time with her friends and family especially her grandchildren. She was employed by the former Costello-Rand Insurance Co., the former Airco Speer Electronics and the former PennBank. She is survived by one daughter, Cindy (Paul) Eakin of Bradford; one son, David (Marie) Shields of Lewis Run; four grandchildren, Ashley (Justin) Conrad, Michael Wolfe, Kaitlyn Shields, Emily Shields; one great grandson, Chase Conrad and several nieces and nephews. In addition to her parents and husband she was also preceded in death by two brothers, Dean Bombasay and Tom Bombasay. The family will receive friends from 11:00 AM to 12:00 PM on Friday, December 7, 2018 at Our Mother of Perpetual Help Catholic Church, Lewis Run, with a Mass of Christian Burial to follow immediately at noon with the Rev. Raymond Gramata as celebrant. Burial will be in St. Bernard Cemetery. Memorial contributions in her memory can be made to the Bradford Area Public Library, 67 West Washington St., Bradford, PA 16701, The McKean County SPCA, P.O. Box 113, Bradford, PA 16701 or the St. Jude Children’s Research Hospital, P.O. Box 1893, Memphis, TN 38101-9950. Funeral arrangements are entrusted to the care of the Mascho Funeral Home, Inc.
To send flowers or a remembrance gift to the family of Lillian L. "Lilly" Shields, please visit our Tribute Store. "Email Address" would like to share the life celebration of Lillian L. "Lilly" Shields. Click on the "link" to go to share a favorite memory or leave a condolence message for the family.